Developing winning fundraising ideas is vital for many charity organisations. There are many factors, however, that are key to your success. These include publicity, advertising, telling the story of your organisation and working with volunteers- the life blood of every fundraising group. Some organisations will do fabulously well with just a couple of very simple ideas that they run out on a regular basis. They are happy with the tried and tested. A well worked template means everyone knows what to do and new volunteers can be easily incorporated. Many volunteers and supporters lack time. They want to help but prefer to know exactly what they are letting themselves in for. Over the years equipment and props are accumulated that can be used time and time again. It is better to use something you already own than buy new each year. Over time an organisation can come to "Own An Event". ie The hockey club always run the annual pram race or The Scouts always sell Christmas mistletoe in the town centre. For these groups the idea is "If it ain't broke don't try to fix it!" Others chop and change constantly to try to come up with new fundraiser ideas. It is sometimes easier to motivate volunteers and helpers with new ideas and passions. You might discover skills and talents within your volunteer group that you weren't aware of. Sometimes people do not push themselves forward because they dont want to tread on someone else's toes. You might draw in new supporters and volunteers. The public too can become jaded with "Same old---Same old" Variety is after all the spice of life! It is easier to attract publicity and sponsorship with a new and novel fundraiser idea. 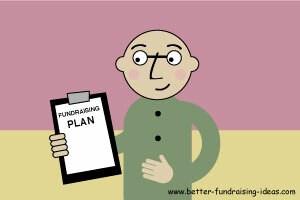 Trying new fundraising ideas however is not without problems and can bring a lot of hard work. There is also the chance that an idea will flop totally! This can be particularly discouraging if people have put in a lot of effort...................But, that's life and if fundraising was always easy our charities would be awash with money and we would all be putting our feet up with a nice cup of tea! Supporting causes close to our hearts is not just about raising money. For many organisations raising the profile of their group, cause or concern is as important as raising funds and this can often help to shape plans and strategies. The links below provide the extra information that you need to help turn your fundraising ideas and strategies into something your organisation can be really proud of. Charity Quotes- Use them in your posters, leaflets, flyers and newsletters. Fundraising Publicity - How to work with the local press. Check out all the latest fundraising books and "how-to" guides.